Zambia is a place of resplendent beauty. Known for its famous Victoria Falls (which it shares with neighbor Zimbabwe), it is said to be one of the great wonders of the world. Majestically imposing, yet radiant in its natural beauty, the Falls tumble thunderously into the Zambezi Gorge and filter into tranquil waters. It is no wonder that such a place of beauty can produce an unassuming young man from Ndola… an outward appearance of tranquility, but an inner force exuding strength and courage. 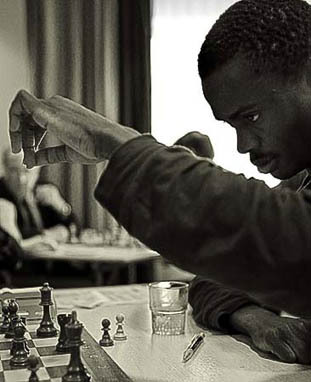 Born January 6, 1982, Amon Simutowe's rise in chess can only be explained by the inevitability that he was destined for greatness. He had originally set his dreams on being a striker for the Zambian national football (soccer) team after starring at the youth level. With his uncle having served as a coach on the National Team and also having coached one of the top four teams in the premier division, football was a natural attraction to young Amon. A shark on the prowl... IM Amon Simutowe. "I didn't have anyone to blame in chess for my losses and I didn't have to wait until I was 18 to compete nationally." ~ Amon Simutowe, on why he chose chess over football. However, his life was changed forever when he asked his brother Solomon (ten years his senior) to introduce him to the royal game of chess at the age of 10. After two months, his interest shifted completely to chess. His older brother saw a healthy appetite growing in his younger brother and began sending young Amon chess books and the British Chess magazine from England. Since chess materials were hard to come by in Zambia, Amon studied these magazines voraciously and two years later in 1994, he would enter his 1st of three local tournaments. "I really didn't do very well, but was praised as the best young player… under 16," said a reflective Simutowe. The work ethic is what eventually distinguished Simutowe from the rest of his compatriots. 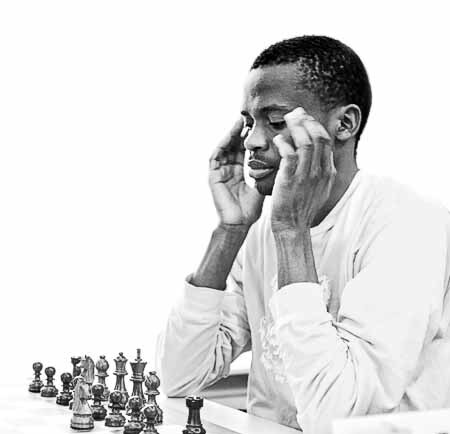 Africa has been a continent sorely neglected when it comes to chess development and players are typically left to find their own way against well-heeled federations with handsome budgets. Simutowe's resourcefulness has perhaps been a blessing since he had to rely only on his own initiative to rise to become Zambia's top player. After winning the nation's under-21 championship at age 13, he caused a mild controversy when he was heard calling the reigning Zambian champion "weak." The Zambian champion gave Simutowe a spanking in their next chess encounter, but Simutowe was still not impressed. He got revenge the next year winning the national championship at age 14! Despite this bout of brash behavior, Simutowe is an unassuming and humble young man. However, he became famous for devouring his competition in Fischer-like fashion winning tournaments by ridiculous margins. He earned the IM title at the 1998 African Zonal (zone 4.3) with the required 66% score and later went on to win the first of his two African Junior Championships. In 1999, he scored a whopping 12/13 followed by an 11/11 score in 2000. After repeatedly terrorizing his competition, he earned the moniker, "The Zambezi Shark." He also carried the Zambian flag abroad in the under-16 championship and beat Iran's Essam Ghaem Maghami who would later become a Grandmaster. 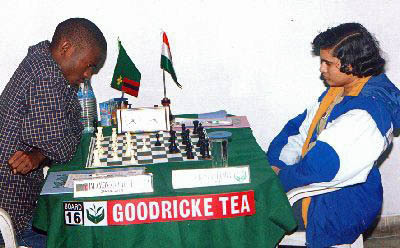 Simutowe playing rising Indian star Humpy Koneru at the 2001 Goodricke International in Calcutta, India (1-0). Photo by goodrickechess.com. The year 2000 was certainly the breakthrough year for Simutowe, he scored 6½-4½ in the British Championship including a beautiful win against IM Colin Crouch. Crouch was so excited at having been a party to the game that he annotated it for publication in the British newspapers. Needless to say, the game is a gem. Perhaps what is not known is that Simutowe was in the race to win the prestigious World Junior Championship in 2000 despite carrying the 42nd seed at 2322. In this tournament he had beaten several strong players including future Grandmasters Surya Ganguly and Pentala Harikrishna. In the last round, he drew and ended a magical run. He ended on 8½-4½ placing joint 2nd behind Cuba's Lázaro Bruzón who scored 10-3. His international reputation was growing. At year's end, he would finally get the chance to represent Zambia on a big stage at the 2000 Olympiad at Istanbul. He turned in an outstanding performance on board one with an 8-2 score and a 2603 performance rating and winning a silver medal. He also qualified for the FIDE Knockout Championships losing to India's Krishnan Sasikiran 1½-½. In a year's time, his FIDE rating soared from 2240 to 2470. It was at this point that he embarked on an international tour to play in competitive tournaments. In the next year, his travels would take him to Goodricke Invitational (India), Cappelle La Grande (France), Bad Wörishofen (Germany), Salou Costa Daurada (Spain), Olympic Masters (Switzerland), BCI Grand Prix (Angola), Smartchess.com (USA), Mayor's Cup (USA), the World Open (USA), Wilbert Paige Memorial (USA). After his 6½-2½ near-GM performance in Capelle La Grande, Simutowe stated he deferred enrollment at an American university to concentrate on the GM norm. Even the 7½-1½ in Bad Wörishofen was not enough for the GM norm. Nevertheless, Simutowe was named Zambia's "Sportsman of the Year," and had strengthened his legend as a national hero. In the last round of the disappointing Wilbert Paige Memorial, Simutowe does some soul-searching. Photo by Daaim Shabazz. Later in 2001, Simutowe traveled to the U.S. for the first time and his hectic travel schedule had caught up with him. He had a series of bad tournaments ending with the historic Wilbert Paige Memorial, a tournament with ten of the world's top Black players. It was held at the famous Hotel Theresa in Harlem, New York. Simutowe first trip to America appeared to be a whirlwind vacation and perhaps he had lost focus. Round one was a shocker when he lost a full rook to Canada's Michael Schleifer on a tactical sequence. In the second round, he would come roaring back with a smashing win over Ronald Simpson, but it would be the highlight of the event for him. He made quite an impression in the analysis room showing this game. In the end, a beleaguered Simutowe (the top seed) would only score 4-5 in a tournament won by Stephen Muhammad. "I've basically had a bad tournament. In the last few rounds, I was just waiting to get out of here," he stated. It was clearly a humbling experience for the then 19-year old Zambian. After this disappointing run of tournaments, and losing 2-0 against Ilya Smirin in the 2001 FIDE Knockout Championships, Simutowe rating had tumbled from 2470 to 2368! He talked about the importance of getting a trainer. However, after enrolling in the University of Texas-Dallas on an academic scholarship, he was fortunate to be in an environment where chess received support. He became an integral part of the UTD chess powerhouse. During his four years, he helped UTD win two national collegiate titles and became known for dominating local tournaments and working in the community with children. However, the GM norm remained an elusive goal. After a 6-3 performance at Maurice Ashley's HB Global Chess Challenge in 2005, he gave an interview to The Chess Drum and stated how much he was focused on his studies. However, he vowed to round back into form. 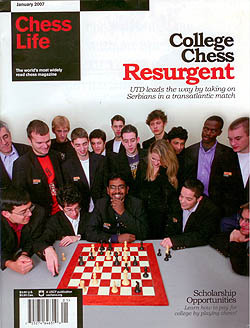 Amon Simutowe (far right) with his University of Texas-Dallas team on the cover of U.S. Chess Life. Simutowe enjoyed his years at UTD and stated in an interview that they were four of the best years of his life. After having graduated with high honors (3.73/4.00) from UTD in December 2006, the young Zambian was forced to make hard decisions on his future. He had been preparing applications for graduate school and chess became an afterthought. Would he continue his GM title quest? At some point in the early 2007, Simutowe made the decision that would change the course of his life. In a May 28th interview with The Chess Drum, he stated his intention. "The most important decision for me was to decide that I would put in the next six months to get the norm done," he stated. He then charted a course by listing a number of competitive tournaments to get into form and made pleas for financial and material assistance. While neither of those materialized, he started to receive encouragement from strange places. "I really love chess. I've learned a lot… about life… about struggles… people I've met. I don't think I would've learned as much (without chess)." 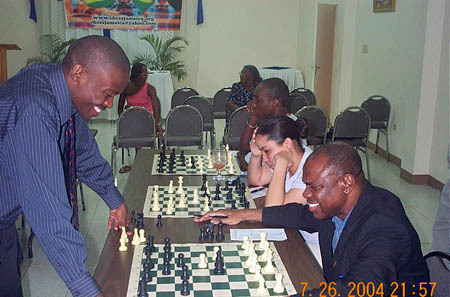 Simutowe jousting with Jamaica Federation President Ian Wilkinson in a 20-board simultaneous exhibition in Jamaica. Photo by Daaim Shabazz. The aforementioned interview was conducted during the Chicago Open where he was inspired by his exciting draw with GM Alexander Shabalov. He realized that he was playing at a decent level once again. At the same tournament, something strange happened. GM Anatoly Lein forfeited his last-round game with Simutowe by stating, "I am not going to play you because it's unfair to play two Grandmasters in a row with black pieces." 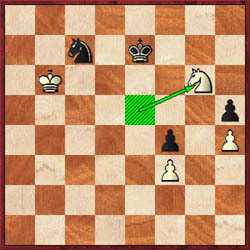 Of course, Simutowe was not a Grandmaster, but perhaps the wise Russian master had seen something. These signs and others would continue to follow the young Zambian. He then trekked to the National Open, World Open, U.S. Open and the New Jersey Futurity… following his dream. His results were mixed, but Simutowe had played some inspiring chess. This included a sparkling win against GM Hikaru Nakamura at the U.S. Open. Congratulatory remarks came in from around the world. Simutowe finishes Nakamura with the snappy 27.Rxg7! Rxg5+ [27…Kxg7 28.Qh6+ (Also 28.Bh6+ Kh8 29.Qe7 mating) 28…Kh8 29.Bxf5 with a mating attack] 28.Qxg5 Bxe6 29.Qf6 1-0. After a mediocre New Jersey Futurity event, Simutowe stated that he needed a break. The opportunity came for him to travel to the tropical island of Trinidad & Tobago to play in the CMMB Caribbean Championships. He would come in joint 1st with Cuba's Humberto Pecorelli-Garcia and the tournament would provide him with a tune-up for the Euwe Stimulans tournament in the Netherlands. Armed with one piece of heavy luggage and his laptops, Simutowe then flew from Trinidad to Barbados, transferred in London and then on to the Netherlands for the Euwe tournament. Playing against three legendary figures and several hungry lions, Simutowe prepared for a tough road. "This is incredible for me. I was hoping for a good tournament but I did not expect such a good start. What is even more incredible is that I have won three of these four games while playing black pieces as this is considered a disadvantage. Gaprindashvilli is a 66-year-old female chess legend who was the first woman to earn a male grand master title. Playing her was a great honour and beating her was something else. She is a former women's world champion and first woman to earn a male grand master title." Simutowe was in form at the Euwe Stimulans. He increased his position after winning against another legend, Fridrick Olafsson. The "Zambezi Shark" was on a blistering 5½-½ and within sight of his final GM norm. His games exuded strength and courage and he was in top form. However, his games were long and grueling. He had mentioned in a Zambian Post interview that the style he prepared for his opponents was producing long games and that energy may become a factor. However, he mustered up enough energy to beat 21-year old WGM Bianca Muhren in a sharp battle. The game descended into a technical ending which the Zambian squeezed a win from a probable drawn position. With two more rounds to gain a ½-point, Simutowe played a crucial game with 17-year old Helgi Dam Ziska of Faroe Islands. A loss would mean that he would face a surging Dibyendu Barua in the last round of the tournament for his norm. This was dangerous as Barua had won five games in a row after a second-round loss and was rounding into top form. In the game against Ziska, Simutowe equalized and was pushing for the initiative when he began to run short of time. His 36...Nc7? allowed Ziska to play for a win after the ensuing complications. Mired in blistering time pressure, Ziska missed a win and Simutowe miraculously saved the draw. Only the two kings and two queens were left. "Mission accomplished!" he wrote to The Chess Drum. Congratulatory remarks came flowing in from all corners of the globe as the Zambezi Shark had successful trod the hard road to his 3rd GM norm! After Ziska's 58.c7! 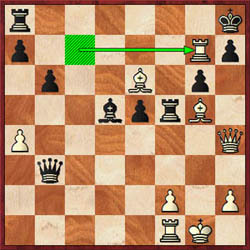 Nxc7 (diagram), white Ziska played 59.Nxg6+? allowing the win to slip away. 59.Kxc7 would on the spot. 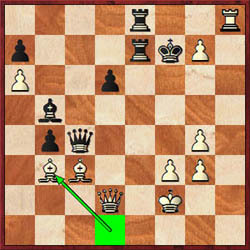 Simutowe was able to reach a technical draw and earn his last GM norm. Was this destiny? He went on to draw with Barua in the last round in yet another grueling battle. Simutowe pressed for a win until the 83rd move when a draw was agreed. The draw would give him clear 1st to add to the prestige of his final GM norm. 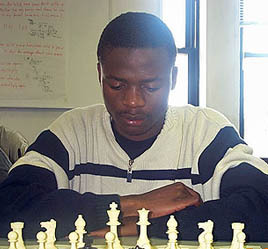 After earning earning his final norm, Simutowe expressed his desire to serve as an ambassador for chess and moreover feels it is an obligation. He ended the tournament with a draw against Barua capping off the tournament with an undefeated 7½-1½ score and a 2687 performance rating. It is befitting that he would be ushered into Grandmaster status by legends Nona Gaprindashvili, Oscar Panno and Fridrick Olafsson. Asked about his interaction with the legends, he stated that Gaprindashvili congratulated him on the way he played the endgame. "She was disappointed. She is quite competitive. It makes sense… her high drive to succeed made her a legend." Simutowe was very impressed with Oscar Panno's generosity after they fought to a draw in the French. "Panno responded with the French to surprise me because he knew I was well prepared for his Sicilian. Apart from congratulating me for my achievement, he was very interesting during our analysis...he spoke of special games he had played with Spassky and gave some extra analysis about the opening which was very instructive." Olafsson congratulated Simutowe and mentioned that he was the first Grandmaster of Iceland and knew how special this moment was for him. Of course, Simutowe is still required to get the ELO points to reach 2500, so he has enlisted additional tournaments to reach this standard. He will compete in the African Championship beginning on August 31st along with his brother Musatwe. If Simutowe is successful in winning one of the six coveted spots, it will make his 4th trip to compete in the FIDE Championship cycle. Simutowe's presence in the African championship will take on a symbolic significance since other Grandmasters from Africa will be present. 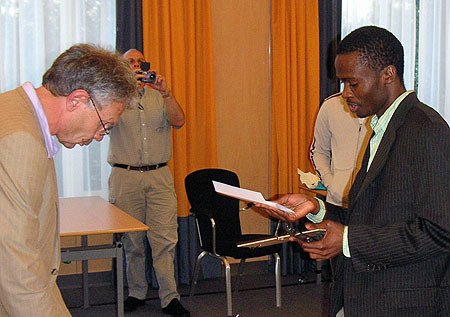 Upon conferral of his title in the near future, Amon Simutowe will become the 6th Grandmaster in Africa having been preceded by Slim Bouaziz (Tunisia), Hichem Hamdouchi (Morocco), Slim Belkhodja (Tunisia), Ahmed Adly (Egypt) and Bassem Amin (Egypt). He will become the first Grandmaster from sub-Saharan Africa and this will place him in the position of an ambassador for African chess. From the excitement generated from his feat, it is apparent that he has inspired people of African ancestry far and near. It is a journey to become part of the storybook legends and perhaps a common theme in personal endeavors. 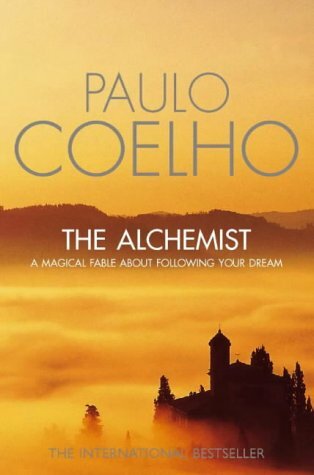 In Paulo Coelho's, "The Alchemist" a young traveler named Santiago meandered from his native land in search of his "Personal Legend." At different points in his journey, Santiago, encountered many places and met many people who would make a deep impression on his life. As he trekked through the Sahara desert in search of his elusive treasure, he faced many tough decisions. One of them was whether to continue his search for his treasure. At one point, he almost gave up his search, but he continued forward. After many trials and tribulations, twists and turns, success and failures, he found his treasure… in a place he least expected! Amon Simutowe left his native Africa uncertain about what the future may bring. Having settled in a foreign land, he was able to meet considerable success and earn an education that would shape his life. He encountered many places and met many people who would make a deep impression on his life. Unfortunately, the allure of becoming a Grandmaster was fading. After deep introspection, he decided to continue his journey in quest of his Personal Legend… the title of Grandmaster. With renewed inspiration, he forged ahead. Despite the lack of resources, personal trials and tribulations and occasional self-doubt, he accomplished his dream! While Simutowe did not travel across the Saharan desert, he has traveled a long way to find his Personal Legend. When he left the Netherlands after earning his 3rd norm, he flew over the Sahara, landed back on African soil with his destiny fulfilled as a chess Grandmaster. "Maktub"… it was written! Amon Simutowe receives his certificate for the GM result. Photo by Ben Schulte. and written by Daaim Shabazz, Ph.D.